Aside from the Air Jordan Retro High RTTG we previewed earlier, Jordan Brand is also set to release the “DC” edition of one of their newest models, the Jordan Super.Fly. Part of Jordan Brand’s World Basketball Festival 2012 Collection, this Obsidian/Metallic Gold – White colorway of the Jordan Super.Fly will be hitting the market this Saturday, July 14, along with the “DC” edition of the Air Jordan Retro High RTTG. 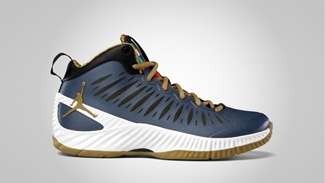 This top-class sneaker, which boasts light-weight quality and superb responsiveness, features obsidian accents enhanced with white touches on the midsole and gold accents on the slits, laces, outsole, and Jumpman branding. Expect this one to be a hit this weekend so don’t dare miss it!